A Shorten Labor Government will deliver a fairer Long Stay Parent visa so that Australian families from migrant and multicultural backgrounds can reunite with their loved ones. As Australia’s migrant and multicultural communities re-establish their lives in Australia, the ability for families to reunite with parents and grandparents still overseas with existing visas is limited, expensive and some have wait times of up to 50 years. Many elderly parents want to reunite with their families but have to travel to Australia as tourists – proving costly, frustrating, disruptive and exhausting as they ferry between countries. The Liberals’ unfair Temporary Sponsored Parent visa is completely different from the commitment they took to the 2016 election – with unfair conditions and higher fees for families wanting to reunite. But the most heartless, callous and cruel condition of the Liberals’ visa is that they are forcing families to choose between which parents or in-laws they reunite with by limiting the visa to one set of parents per household. Can you imagine the choice a family has to make in choosing which parents or grandparents get to join them in Australia? This is what the Liberals want for Australia’s multicultural and migrant communities. Labor’s fairer Long Stay Parent visa will allow parents and in-laws to reunite with their families and let all grandparents spend quality time with their grandkids. The Liberals broke their promise to migrant and multicultural Australians when they forced families to choose between which parents or in-laws they could reunite with – or which grandparents get to meet and spend quality time with their grandkids. The Liberals’ unfair Temporary Sponsored Parent visa is a broken promise to Australia’s migrant and multicultural communities and proof Scott Morrison cannot be trusted. Labor’s fairer Long Stay Parent visa will be more affordable for families – unlike the Liberal’s expensive fees that see families paying up to $40,000 to access visas. Labor knows that modern Australia and multicultural Australia are the same thing – which is why we value families being able to spend time together and help each other. Only a Shorten Labor Government will deliver a fair go for Australia’s proud migrant and multicultural communities with our fairer Long Stay Parent visa. The funding will reverse Liberal cuts to emergency relief organisations and provide a much-needed funding top-up to the emergency relief sector. This includes $59,000 to Padstow Community Care to deliver local services. In addition, a Shorten Labor Government will provide $596,000 to St Vincent De Paul Society NSW and $3 million to the Salvation Army to deliver services across the ACT, NSW and Queensland. Emergency relief organisations support vulnerable Australians who have nowhere else to turn by providing food hampers, transport vouchers and financial assistance. The charities and not-for-profits that do this work are increasingly stretched and need more resources. Under Liberal cuts, many emergency relief services will be forced to close their doors or slash services by the end of the year. Only a Labor Shorten Government will re-invest and support these vital services. • Reversing the Morrison Government’s $5.5 million a year cut to emergency relief organisations across the country. A Shorten Labor Government will make sure our charities have the resources they need to support those who most need it. A Shorten Labor Government will invest $400,000 into upgrading the Riverwood Community Centre. Labor’s $400,000 grant to would go to completing works such as painting the facility, laying new carpets, expanding the air-conditioning within the building, and other long overdue structural improvements. The Riverwood Community Centre is the heart and soul of the Riverwood and Narwee area. We’ve heard from the community how valuable it is. Its programs and services improve and enrich the lives of everyone in the community, from infants to our senior citizens, teenagers to new parents and cultural groups from every continent on earth. 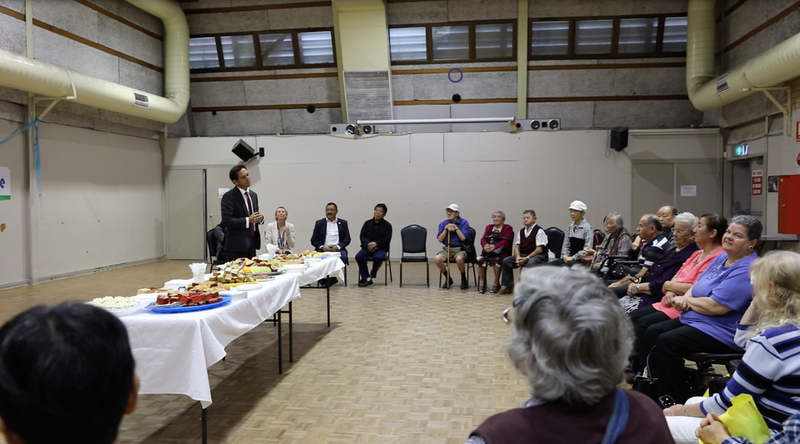 Riverwood Community Centre has continuously touched the lives of locals throughout its forty year history and is a precious community asset that must be strengthened for the future. This grant will help secure the centre’s future - it is the sort of thing you can do when you prioritise everyday people above big business and the very wealthy. Children’s imaginative play and social connections between parents will be nurtured with a $15,000 grant from Labor to Playgroups NSW to expand the St. George zone area, creating greater access to 12 local playgroups for families. The St. George zone area of playgroups provides over 40 sessions of Playgroup a week, providing access to early education and learning to children in a welcoming, and safe environment which gives children access to a range of educational toys and developmental experiences at low or no cost. If elected, Labor’s $15,000 grant to the Playgroups NSW would go to expanding the 12 playgroups in the St. George zone. Specifically, this funding would assist playgroups in providing intergenerational support, boosting cross cultural participation and providing greater inclusivity. In harnessing these three pillars of intergeneration, cultural participation and greater inclusivity, playgroups in the St. George zone will be able to boost participation to a wider community, all the while providing improved access with better materials to local families and carers. Playgroups NSW is a valuable community resource for families unable to afford to provide toys and educational aids to their children. Early learning assistance, like that provided through Playgroups in the St. George zone, encourages play-based learning and social development in babies and young children and helps facilitate friendships and peer support for parents and carers. This funding for Playgroups NSW is greater support from the Commonwealth and is a long overdue recognition of the important place it has in the local community. Labor is committed to doing more to promote early childhood development. Labor has announced the biggest ever investment in early childhood education in Australia with the $1.75 billion National Preschool and Kindy Program. Labor’s plan will see around 700,000 three and four year olds access preschool and kindy every year. This will also help parents balance work and family and help reduce the child care bill for families with children already in early education. A Shorten Labor Government will partner with NSW Labor to deliver much needed health services in Sydney’s south west by investing in a new integrated HealthOne facility. Federal Labor will spend $10 million to establish the new HealthOne service - which brings together general practice and state-funded primary and community health care services – in Peakhurst.. Currently this area is extremely underserviced in terms of health services. The nearest hospitals are St George or Bankstown, both 30 minutes’ drive in heavy traffic. There are no large 24 hour medical centres with allied health services within the area. This means patients requiring basic urgent treatment have little choice but to go to a major tertiary trauma hospital and often spend hours in overcrowded emergency departments. “It will also provide additional primary and community health care services. Both of these measures will take pressure off our local hospitals by preventing unnecessary visits to emergency departments.” Mr. Gambian said. A new HealthOne facility in Peakhurt or Peakhurst Heights would service the growing populations in Riverwood, Narwee, Beverly Hills, Lugarno, Peakhurst, Peakhurst Heights, Mortdale, Penshurst and Oatley. HealthOne clinicians work in collaborative teams to provide prevention, early intervention and continuing, comprehensive primary health care. But instead of investing in new services like this one, all the Abbott-Turnbull-Morrison Government has done is cut from NSW hospitals – slashing $17.2 million from South Western Sydney Hospitals alone. That’s equivalent to 26,000 emergency department visits or 42,000 outpatient appointments. It could also pay for 48 nurses, 660 knee replacements or nearly 5000 cataract extractions. Mr. Gambian argues that the people of Sydney’s south west deserve better. Labor will reverse the Liberal public hospital cuts with our $2.8 billion Better Hospitals Fund, to ensure and ensure our emergency departments and hospital wards have the doctors, nurses and hospital staff to keep up with record demand. We can afford to protect Medicare and fix our hospitals because we are tackling unfair tax loopholes and making multinationals pay their fair share. A Shorten Labor Government would contribute $5 million to the refurbishment of Kogarah War Memorial Swimming Pool at Carss Park. Chris Gambian, Labor’s Candidate for the seat of Banks, announced the commitment today. The refurbishment will be based on consultation with pool users, but could include the addition of access ramps at the facility, upgrades to the gym and change rooms, extending air conditioning throughout the complex and undertaking remedial works to address the aging of the pool but a final decision would be based on consultation with pool users. Since opening in 1965, the pool has been the home to 17 world champions including Olympic swimmers Michelle Ford and Janelle Elford, marathon swimmer Suzie Maroney, and boxer Anthony Mundine. “Carss Park Pool is a much loved community resource and has helped produce some of Australia’s best swimmers” Mr Gambian said. “The pool holds a special place in the hearts of locals and it is my hope that this injection of money will revitalise the pool and start a new chapter in the historic story that is Carss Park Pool. Mr Gambian acknowledged the strength of the community campaign to save the pool. Simon O’Brien, Labor’s Candidate for the seat of Cook, is delighted Labor is committing to the much needed upgrades. “Under Labor, this iconic pool will get attention it deserves so that it can continue to serve the local community” said Mr O’Brien. As well as its history of elite athletes, this facility will continue to give residents in the region access to learn to swim classes. Labor's Swim Smart program will make sure Aussie kids have access to swimming and water safety lessons in primary school. We want to make sure Australian children are strong swimmers and safe in the water. From the 2020 school year, Labor will fund additional swimming lessons for schools that need it, catch-up lessons for kids needing extra support, and more support for the cost of transport and pool entry fees. Labor knows that investing in infrastructure isn’t just about building roads and rail – it’s about investing in better lives for the community, through increased access to sports and leisure facilities like this one. Labor has made hard budget decisions to ensure our priorities are fully paid for – we will make multinationals pay their fair share and close unsustainable tax loopholes, because we want the Kogarah community to have access to modern swimming facilities. “I am the product of parents who worked their whole lives to educate me; and teachers and schools that went beyond the call to help me reach my potential” said Chris Gambian, who was preselected unopposed as Labor’s candidate in the federal seat of Banks last week. Chris has spent his career speaking up for others, as a union organiser and through community organisations. He was very active in the campaign to save St George Bank from takeover by Westpac, which resulted in conditions on the sale being imposed to protect jobs and services. Authorised by Chris Gambian, Australian Labor Party (NSW Branch) 377 Sussex St Sydney. No taxpayer funds used to produce this website.